Fresh sweetcorn is in abundance in the UK at the moment and I can’t get enough! Sweet and juicy it is a great addition to salads, as fritters, or just grilled on the cob and served with lashings of butter and a pinch of chilli. I have paired Ottolenghi’s recipe for sweetcorn polenta with an old favourite of mine, mushroom stroganoff, to create this really delicious and warming Autumn supper. 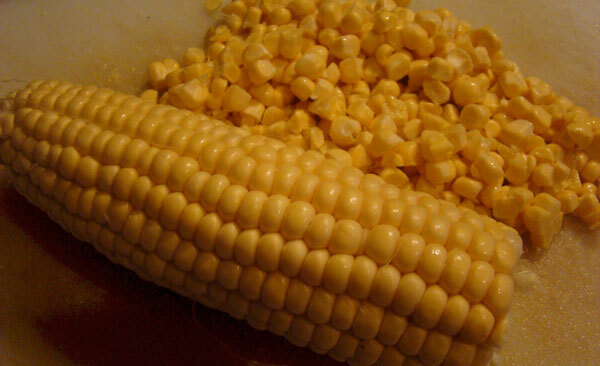 The sweetness of the corn is perfectly balanced with the savoury richness of the strog. To make the strog, dice the onion and garlic and slice the mushrooms. Add a glug of olive oil to a fry pan and cook the onions and garlic on a medium heat until translucent. Add the mushrooms and stir until browned. Add the vegetable stock, bring to the boil and turn the heat down to a low simmer. Stir in the tomato puree, sour cream and herbs and allow the sauce to thicken, stirring occasionally for 15-20mins, season with salt and pepper and stir through the spinach until it has wilted then remove from the heat. Whilst the strog is simmering you can start on the polenta. Chop the very top and bottom off every corn ear. Stand the ear on its base, and use a sharp knife to shave off the kernels. Place the kernels in a medium-sized saucepan and pour in the water, to cover. Add half the butter and cook on a low simmer for 12 minutes. Lift out the kernels with a slotted spoon, and transfer to a food processor. Process for quite a few minutes, to break as much of the kernel cases into a puree. If the mixture is too dry to process, add a little of the cooking water. Return the corn paste to the water pan and, over a low heat cook again for about 10-15 minutes, making sure you stir the mixture regularly, until it thickens to the consistency of mashed potato. Now fold in the remaining butter, feta, salt and pepper, and cook for two minutes longer. Dish the polenta into shallow bowls and spoon portions of the mushroom strog on top. Garnish with some thyme tips and if you have some truffle oil, drizzle over the top. Serve hot. nom nom i say this looks awesome! I shall have to cook it! 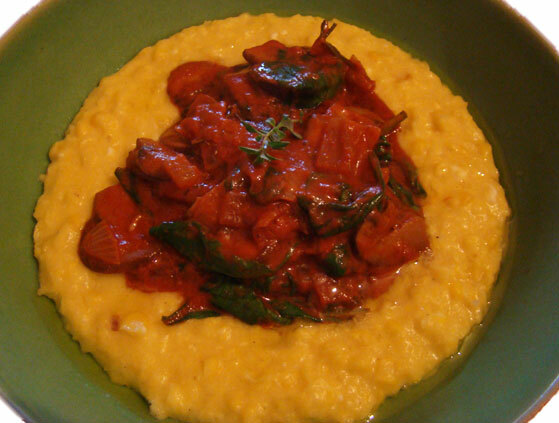 I think you will really like this one Lala – esp the corn polenta it is delicious!